How to Put an End to Your Ant Control Problem - Yes Pest Pros, Inc. How to Put an End to Your Ant Control Problem - Yes Pest Pros, Inc.
Ants are often portrayed as harmless little insect that love to steal picnic watermelons, but the truth is that they can do much worse. If you have found that your house has an ant control problem, you know just how hard it can be to get rid of them and how stressful they can make your life. Simple tasks like throwing a small dinner party can be torture when you know that any or all of your guests could find ants lurking in a corner, or even in their food. You know what they will think: You and your home are dirty. 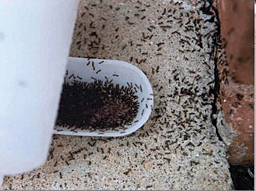 That is the stigma, but in reality, ants will get inside of any home they can, dirty or not. For most people, the ant infestation is not a matter of dirty living conditions, but of ant friendly environments. d sources. Ants are most active in the warmers months, so they love the chance to come inside into a cooler temperature. If there are cracks in your foundation, gaps in your windows or door or other holes that make entry easy, ants will find them and make themselves at home. Having all your gaps, cracks and holes closed is the best prevention. Once they get inside, they will make their way to the nearest food and water source. Places like kitchens and bathrooms are their most common spots because of the water they can get from countertops and leaky faucets and pipes. Kitchens also have the added bonus of food. Ants love sugary foods, so things like fruit, juice, cookies and candies are sure to attract them. Do not leave them out and after you have eaten these foods. Be sure to clean the area thoroughly so it doesn’t leave a trail. Once ants find a food source, they will go back and alert others. That’s how colonies get started. If you suspect or know that ants have already built colonies in or around your home, it is best to contact ant pest control professionals to come in and solve the problem. Ant colonies can be huge and hard to find. Even if you find one on your own, there is a good chance that you haven’t found them all. This is why many people fail when they attempt to solve the problem on their own. They will destroy a colony and then continue to see ants all over. Young Environmental Solutions is able to do a thorough examination to find all the entry points and ant colonies. Once the colonies have been destroyed and the entry points have been sealed, you will longer have to worry about ants invading your home.